First Ecuadorian astronaut trained at the Gagarin Cosmonaut Training Center in Russia. Set a record for high gravity tolerance at the Novgorod Air Base. Founder of the Ecuadorian Civilian Space Agency EXA and creator of the Ecuadorian Civilian Space Program. Creator of the DEDALO Project and the first microgravity airplane in Latin America. Set Guinness’ world record with the POSEIDON Project. Creator of the HERMES ground station, the first permanent internet-to-orbit gateway. 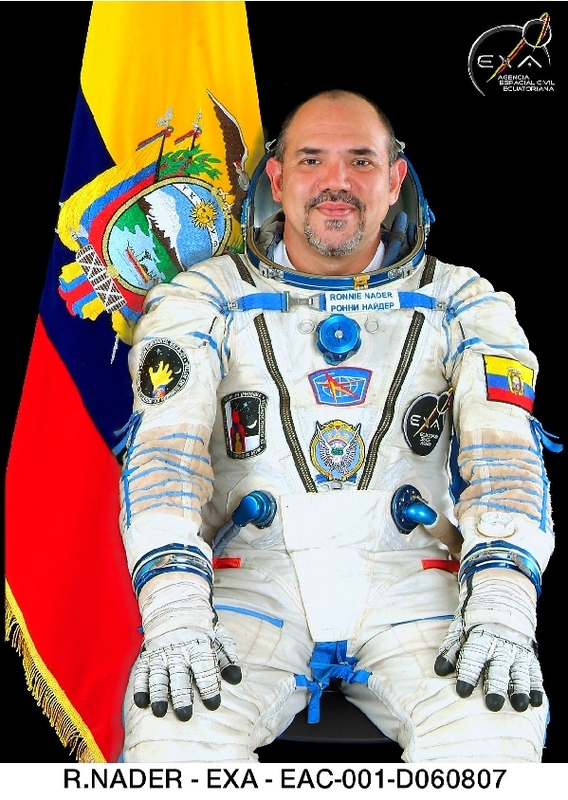 Commander of 7 microgravity missions for the Ecuadorian Air Force. Creator of the Hyperion ultraviolet radiation monitoring network. Creator of the first Ecuadorian satellite. Chief Engineer for the Pegaso and Krysaor Projects. Mission Director for the Ecuadorian satellite program. 44 scientific studies published and defended at national and international levels. 4 Medals for Scientific Merit. 8 national and international recognitions. Married 18 years to María Mercedes Drouet. They have 3 children: Gerard, 15, Jules, 13, and Elisse 10. Commander Nader, you are recognized worldwide as the creator of the Pegaso nanosatellite project. What does this mean to you personally? “The first memory I have that’s related to space was when I was 2 or 3 years old. It was night and my mother was bathing me. When she finished, she took me out of the bathtub and put me on the bed. While she was putting my pajamas on me, I was watching a TV cartoon of a white horse with wings that flew through the star-filled night sky. I felt I belonged there. I was fascinated by the star-studded sky. This TV show was discontinued and then I landed here. Years later, when I was about 13, I contemplated the stars again and dreamed of building my own space ship. I vowed that if some day I ever did that, the name of the space ship would be Pegaso. Now, 40 years since Pegaso flew away and left me behind, he has finally returned. Once again he will fly triumphantly through the starlit sky. Once again his silver wings will adorn the black velvet of space, and this time he will sing our national anthem and announce to the world, revolving below his powerful wings that the people who live at the Middle of the World have been able to reach the heavens through the efforts of their sons. And it’s been their sons alone and their very own hands that have made the dream come true, because we have grown, we have become great, and now we are a Nation of Space. How do you think our childhood dreams can finally come true? What’s necessary for that? In my experience, dreams don’t just happen. You have to search them out and make them happen, and it’s in that journey that we become adults. You have definitely proven to be self-taught. You even started studying nuclear physics by yourself when you were 13. So you began early and now you’re beginning to harvest the fruit of your labors. But what would you say to people who are no longer children or teenagers but who still have shadows of dreams that pass through their minds and hearts and perhaps sometimes leave them frustrated because they never tried to make them come true? That it’s never too late. It may be more difficult, but it’s never impossible. That if they really love their dreams, they should risk everything they are for what they can become. That they dare to live as high as their dreams. Like only a few people in the world, you have had the privilege of surpassing the limits of your imagination and literally crossing the limits of space. Tell us what would happen if on a space mission the crew members didn’t strictly obey the established norms and regulations. I mean if each crew member did “whatever he felt like” and didn’t make much effort or feel committed. Would they face any risks? How bad would it be? That couldn’t happen. A space mission is very high-risk. The lives of everyone would be in danger if someone didn’t obey an order or simply panicked. That’s why the selection of astronauts is so rigorous. What’s most important is their self-discipline and their even-temperedness. Using this example of a space mission and how critical the lack of the crew’s commitment in this kind of mission as an analogy, what advice would you give our national and international readers, to average citizens who daily face challenges and struggles in their professional lives or jobs or even in their family life and who have perhaps become infected by the indifference or mediocrity of others? I can only say what I repeat to my children: a professional does what he has to do when he has to do it and how he has to do it, no matter how he feels or what the circumstances are. Speaking of challenges, what are the challenges you’re facing now that you’re heading up this Immense Pegaso Project and the challenges you must surely have had to face during the 7 space missions you have commanded? How would you define them generally speaking, and what strategies have you used to overcome them? We face uncountable challenges, because everything is new for us. That’s the price of being a pioneer. There’s just one strategy -never give up, nothing is impossible! In your Letter to the Nation of Ecuador (2011), you mentioned that the voluntary team that worked in the creation of Pegaso was “inspired to challenge the unimaginable and conquer the impossible.” What did you and your team need for that to happen and finally reach space, something our ancestors most probably never dreamed of? I think the most difficult part of the project was managing a group of volunteers, because we couldn’t demand anything of them and could only try to inspire them. The number of things and challenges we had to overcome would be too many to innumerate for these pages, but there were even challenges of a human nature that we had to face and overcome. That was the journey in which we grew as human beings and professionals, because it wasn’t enough for us just to reach our goal. We had to conquer it with honor and sacrifice because it’s not the goal that makes you great, it’s the journey. What has most motivated and inspired you to fulfill your greatest dream that of reaching space? He hasn’t found a reason to say no. You are definitely an example of “excellence” for many. What does “being excellent” and “acting with excellence” mean for you in practical terms? Doing what I have to do how I have to do it and when I have to do it. Doing it well, doing it fast and doing it so I can’t say I could have done it better. And now as we’re about finished, I invite you, Commander Nader, and our readers to imagine just for a moment that we’re all part of a “Towards Excellence” Space Mission and each one of us has been assigned a specific function. You, of course, are the Commander of the mission. What instructions and advice do you have so this mission “towards a life of excellence” will be successful? That you live as high as your dreams, that you don’t reach old age looking back and wishing you’d give anything to relive this moment and that you risk everything in at least attempting to carry out that great project, that great dream that’s always been hanging out there like a star in the window of your soul. To conclude, how does Ronnie Nader define or identify himself? “Today I’m a 41-year-old astronaut, the first in the history of my country and I’ve been the Commander of 7 space missions. My space suit is black like space and silver like the stars. I was able to establish my country’s first Space Agency, the only civilian space program in the world, and I’ve given it the technology needed to defy gravity. Thanks to it, we established the first scientific world record in the Guinness Book of Records. Today my country is a recognized leader of space. Today they call me a “hero” for putting my country in first place, second to none.